Tracy Goodermot gets some help from good people. 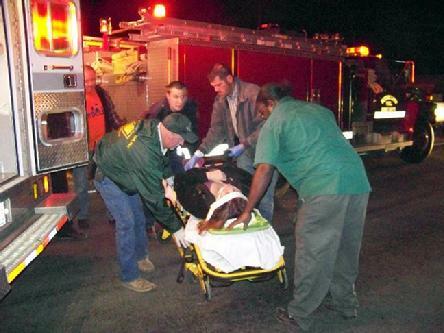 Hit and Run on Scenic Loop, LIVINGSTON, November 23, 2008 - Shortly after 8 pm on November 22, 2008, Tracy Goodermot, 31, of Livingston, was walking west-bound on 3277 when a vehicle that was also west-bound hit her from behind knocking her into a ditch. Two men who spotted her situation from a distance rushed to her aid. The driver of the vehicle fled the scene. Polk County Sheriff's Deputy, Jaimie Buie was dispatched to the scene along with DPS Trooper Darwon Evans. Others who assisted were the Scenic Loop Fire Department and Polk County Sheriff's Deputies Terri Mayer and Jami Johns. Goodermot was transported to Livingston Memorial Hospital by Americare Ambulance. The extent of her injuries haven't yet been revealed. Because the hit and run took place after dark, there was no vehicle description, however, the incident is being investigated, and law enforcement are trying to find out who the perpetrator is. 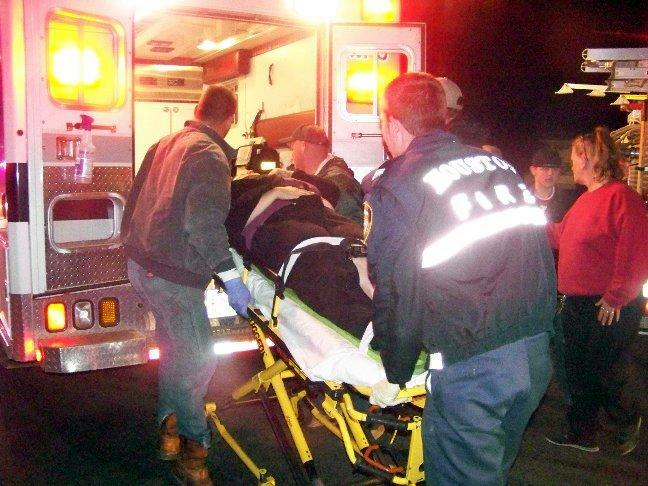 Goodermot was loaded on an Americare Ambulance and transported to Livingston Memorial Hospital.